Rival fundraising platforms have made moves to attract new charity customers in the wake of the announcement that BT MyDonate is to close. The telecommunications company BT announced this morning that it would close the fundraising platform at the end of June because fundraising technology had moved on and that many other such platforms were available for people and charities to use. 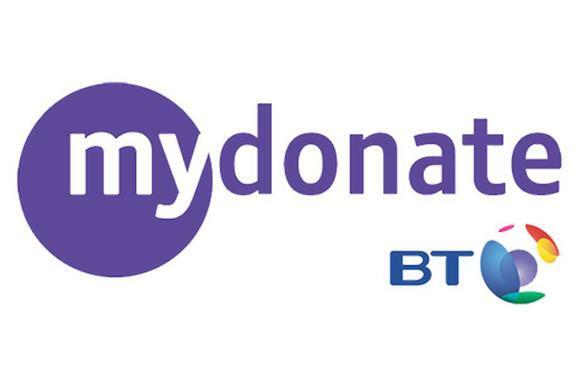 BT MyDonate was the first commission-free fundraising service when it was introduced in 2011. Around 12,000 charities are registered with the service, of which around 7,000 have received donations in the past six months. Virgin Money Giving quickly announced this morning that it would temporarily drop its £150 joining fee for charities looking for a new fundraising platform. VMG, which operates on a not-for-profit basis, said its offer would run until 30 April, with charities required to start raising funds on the platform by 30 September. Jo Barnett, executive director at VMG, said: "Anyone affected by today’s announcement from BT MyDonate will need to consider their fundraising options and the fees and charges they are likely to pay in the future. "Not all fundraising platforms are the same and we believe our model offers a viable, long-term, transparent solution for charities." JustGiving said it was offering a three-month free trial for charities to sign up to its platform. "We will be looking to present several webinars, events and other services over the coming weeks and months to ensure that we offer all the support possible," a spokesman said. "Our overarching concern is making sure that these small charities face as little disruption as possible and to demonstrate to them our commitment to them and the sector as a whole." A spokeswoman for the fundraising platform GoFundMe, which does not charge a platform fee, said it "remains committed to working with new charity partners and helping to ensure the cash of kind-hearted Brits goes to great causes". Small charities have voiced concern that they will be particularly affected by the closure of BT MyDonate. Angela Style, interim chief executive of the Small Charities Coalition, said: "Although the coalition recognises that fundraising platforms have running costs, one fewer zero-Gift-Aid-fee platform is bad news for the smallest of small charities. "BT MyDonate will be missed by thousands of small charities, in particular the 84 per cent of charities in the sector that have a turnover of under £100,000 a year." Katie Lawson, head of fundraising and communications at Tiny Tickers, which works to improve the early detection and care of babies with serious heart conditions, said on Twitter that the closure of BT MyDonate was bad news for smaller charities.